The glorious Eastern Tiger Swallowtail is one of North America's most showy and common species. Ironically, most of those we currently call Eastern Tigers in Massachusetts may actually be part of a large northern hybrid complex, or "hybrid swarm," which differs genetically from the "classic" Eastern Tigers found south of Pennsylvania. In 1991 the Canadian Tiger Swallowtail was recognized as a species separate from the Eastern; it is widespread in central and western Massachusetts. More recently, the Appalachian Tiger Swallowtail ( Papilio appalachiensis) has been recognized as a species ( Pavulaan and Wright 2002; http://www.butterfliesofamerica.com/papilio_appalachiensis.htm), and has been shown to be a hybrid of the previous two species, diverging from the parent species about 100,000 years ago (Krushnamegh et al. 2011). It is found mainly at mid- to high-elevations in the Appalachian Mountains, but some believe that the Appalachian Tiger Swallowtail or something similar may occur in Massachusetts (e.g. M. Arey, masslep 6/27/2010; H. Pavulaan, masslep 6/3/2009). Most of Massachusetts except possibly the southeast coastal plain is an overlap zone between Eastern and Canadian Tiger Swallowtails, in which there may be hybrids and sub-types which have not yet been fully described and which may be genetically and phenotypically complex (Scriber et al. 2003). Among the individuals we presently call Eastern Tiger Swallowtail here, there are size, shape, coloration and flight time differences among regions (differences in phenology), and these are not always reducible to an easy field mark or two. Decades of genetic work may be required to sort out the situation. As an example of the complexity, in June and early July, when the Canadian flight is ending, MBC observers have found fresh, pale individuals which have the ventral front wing yellow spotband nearly fused into a single line, like the Canadian, but on which most other chararacters are classic Eastern Tigers. These could be hybrids or sub-species or possibly even a new species (http://boghnielsen.com/2010/0703/index.html; Pavulaan, pers. com. 7-8-2010). To early entomologists, all our tiger swallowtails were "Eastern Tiger Swallowtail," following the description by Linnaeus of a specimen procured by Peter Kalm during his 1748-1751 travels through the mid-Atlantic states (Calhoun 2010). Scudder called it Jasoniades glaucus, and did not distinguish it from the Canadian Tiger Swallowtail. It seems likely that what we now call the Eastern Tiger Swallowtail (as opposed to the Canadian) was common in the late 1800s, although nearly all of Scudder’s examples of extreme abundance are from northern locations and probably refer to the Canadian. Thoreau describes a specimen of Tiger Swallowtail he obtained along the Assabet River on June 3, 1859. On June 14, 1860 he reports seeing two resting on mud near a brook. A careful observer, he mentions their “two fine lines parallel with the body on the hinder wings” which suggests they were not Canadian Tiger Swallowtails. He had been seeing this species flying in Concord for nearly a month, he says. The dark female form of the Eastern Tiger Swallowtail is not common in Massachusetts, perhaps because the Pipevine Swallowtail, which it mimics, is not common here. However, photos of two individuals, taken in Stow (7/13/2003, T. Murray) and Lexington (7/30/2006, T. Whelan), can be seen at http://www.naba.org/chapters/nabambc/construct-species-page.asp?sp=Papilio-glaucus . The dark form is found more frequently in Connecticut and further south. There is no dark female form of the Canadian Tiger Swallowtail. The Connecticut Atlas found "Eastern Tiger Swallowtail" larvae on black cherry (Prunus serotina), pin cherry (P. pennsylvanica), tulip tree (Liriodendron tulipifera), sassafras (Sassafras albidum), and magnolias (Magnolia spp.) The species is also known to use other cherries, ashes, apple, and wafer ash (Ptelea) (Scott 1986). Beach plum (P. maritima) and chokecherry ( P. virginiana) have been reported (Mello and Hansen 2004: 31). Tulip tree is often listed as the “preferred host,” but it is not a common tree in Massachusetts, and therefore our abundant non-Canadian Tiger Swallowtails must be using other tree species. Photographer Sam Jaffe found ‘Tiger Swallowtail” caterpillars in 2009 on a surprisingly varied list of plants in eastern and central Massachusetts: aspen, bigtooth poplar, cottonwood, birch, elm, white ash, and black cherry. Unfortunately, P. glaucus and P. canadensis larvae were not distinguished, and apparently are only distinguishable in the earlier instars (Wagner 2005: 79). Most of Jaffe's finds were on poplars in the early part of the season –suggesting possible Canadians--- and cherries later in the season. A range of hosts was utilized in a single area: for example, at Wachusett Meadow Wildlife Sanctuary in Princeton, larvae were found on black cherry, ash, aspen, and even viburnum (Jaffe 2009; masslep 8/2/2010). Massachusetts "Eastern Tiger Swallowtails" are found in many open and edge habitats, and are quite at home in parks and suburban residential areas. Some of the tree host plants, such as black and pin cherries and sassafras, are early successional species in Massachusetts, re-growing quickly after a site has been cleared or burned, but then giving way to other tree species in a mature forest. Thus, the "Eastern Tiger Swallowtail" probably benefited from the timbering, burning, grazing and other land-clearing that took place between 1600 and 1850, as European settler agriculture expanded. Its numbers may have increased in those years (Table 1). It is not a species of mature, closed-canopy forests, so as re-growing forests matured, some habitat may have been lost. The MAS 1986-90 Atlas took place before the two tiger swallowtail species were split. Since they had not been distinguished in the field, the Atlas did not fully report on either the Eastern or the Canadian Tiger Swallowtail, The data were recorded as “Tiger Swallowtail spp.” which was found in 173 out of 723 blocs, making Tigers as a whole “Abundant”. MBC 2000-2007 data, on the other hand, show all Tiger Swallowtail species combined to be in the “Uncommon to Common” category (Table 5). They are not seen in as many numbers as some very common species, such as American Copper and Little Wood Satyr. They are not abundant when compared to such species as the Cabbage White. In MBC records, Eastern Tiger Swallowtail is much more frequently reported than Canadian Tiger Swallowtail. Between 1991 and 2009 there were 6793 reports of Eastern Tiger Swallowtails compared to only 1263 reports of Canadians. But there were also 6169 reports of “Tiger Swallowtail spp.”, some of which could have been Canadians. Considered as a group, tiger swallowtails are not declining in Massachusetts, according to MBC sight records. A chart including all tiger swallowtail reports, whether of Eastern Tiger Swallowtail, Canadian Tiger Swallowtail, or Tiger Swallowtail spp. (chart not shown here) shows no evidence of decline. The challenges of precise identification by sight in the field make further breakdown by species unwarranted. Butterflies field-identified as either Eastern Tiger Swallowtail or “Tiger Swallowtail spp.” are reported throughout the state, and from 223 of the 300 towns for which MBC has records, through 2009. The "Eastern Tiger Swallowtail" probably occurs in every town in the state. It is reported from many urban areas such as Boston Arnold Arboretum, West Roxbury, Cambridge, and Burlington. It is sometimes seen flying across downtown parking lots. It is, however, “uncommon” on Martha’s Vineyard (Pelikan 2002). Kimball reported it as "common" on Nantucket in the 1930's and 1940's (Jones and Kimball 1943; 1942 Kimball specimen in MCZ), but MBC has only one recent report (1, 8/6/2012, B. Zaremba and D. Small). 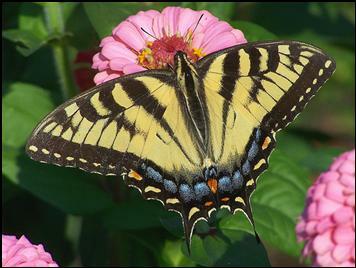 In the western and central parts of the state "Eastern Tiger Swallowtail" co-occurs with the Canadian Tiger Swallowtail. A good view of the ventral front wing marginal yellow spot-band, and/or a good dorsal view, is necessary to distinguish them in the spring, and even that may not be sufficient. The Canadian flight ends in mid-July, and individuals seen after that have been presumed to be non-Canadians. Harry Pavulaan and others (See map in Scriber et. al., 2003: 384) have suggested that Eastern Tigers of the true southern P. glaucus type might be regularly found only in Connecticut, Rhode Island, and southeastern Massachusetts. In all other areas of Massachusetts, most of the "Eastern Tigers" are probably not of the true P. glaucus type, being some genetic mixture of P. glaucus, P. canadensis, and possibly P. appalachiensis (Pavulaan, masslep, 5/23/2010). Seasonal temperature constraints may be part of the explanation. Scriber et al. (2003) found that larvae of P. glaucus x P. canadensis hybrids grew faster at lower temperatures than did those of either parent. The butterfly we presently call "Eastern Tiger Swallowtail" is on the wing from mid-April through October, as shown in the MBC checklist and flight chart (http://www.naba.org/chapters/nabambc/flight-dates-chart.asp). (See photo above.) It has at least two overlapping broods, whereas the Canadian Tiger Swallowtail has only one brood. According to MBC records, the Eastern flies both earlier and later than the Canadian. Interestingly, Eastern Tigers seem to appear later on the Cape and islands than elsewhere: about Memorial Day on the Cape (Mello and Hansen 2004: 31), and not until mid-May on the Vineyard (Pelikan 2002). In the rest of the state, they are uncommon to common from the first week in May. Earliest sightings: In the 23 years of BOM-MBC data (1991-2013) the six years with the earliest ‘first sightings" of Eastern Tiger Sallowtail or Tiger Swt. spp. are 4/2/2010 Northborough, S. Moore and B. Volkle; 4/3/2012 Holliston, R. Hildreth; 4/19/2002 Royalston, C. Kamp; 4/20/2006 Braintree, M. Giles; 4/24/2004 Lexington Great Meadows, M. Rines and R. LaFontaine; and 4/25/2009 Canton Great Blue Hill, E. Nielsen. The years 2010 and 2012 had especially warm spring temperatures. A century ago Scudder (1899: 1299-1300) referred to “the last week of May” as the usual emergence time for New England tiger swallowtails (His flight dates usually rely heavily on the Boston latitude.). The flight is quite probably occurring earlier now. In the twenty-three years under review, there are 12 years in which the first sighting of a Tiger Swallowtail (either Eastern or “Tiger spp”.) was in April rather than May. These years are all since 1998; prior to that year, there are no April reports and sightings begin the first week of May. Latest sightings: In the same 23 years of data (1991-2013), the last sightings of Eastern Tiger Swallowtails have stretched into October or even November in nine years. The October and November sightings occur only after 1996. The seven years with the latest "last sightings" are 11/7/2008, Athol, S. Mildern and N. Rudolph; 10/26/1999 Falmouth Crane WMA A. Robb; 10/25/1998 Gloucester, D. Savich and C. Tibbits; 10/19/2006 Marblehead, K. Haley; 10/16/1997 Royalston C. Kamp; 10/10/2001 Northfield, K. Parker; and 10/10/2011 Brookline, T. Kesting-Handley. These especially late sightings are often individuals seen after the bulk of tiger swallowtails have stopped flying, and may be a partial third brood. The 1986-90 MAS Atlas early and late dates for “Tiger Swallowtail” were 5/3/1986 Pittsfield H. Filios, and 9/4/1986 Middleboro K. Anderson. BOM-MBC dates are both earlier and later than these. In Massachusetts "Eastern Tiger Swallowtail" is widespread and common. Considered in its present taxonomic status (ignoring possible intermixing with Canadian Tiger Swallowtail, and possible sub-types), it is ranked by NatureServe as S5, or secure in Massachusetts. In Connecticut the recent Atlas had 235 project records, compared to 144 pre-project records, suggesting an increase. As Cech puts it, this is a highly successful generalist species, with host trees in several families, and adaptive in habit and habitat (2004: 64). Eastern Tiger Swallowtails range down to southern Florida. Climate warming here would not seem to present an insurmountable obstacle for our Eastern Tigers, even if they turn out not to be genetically identical to southern Eastern Tigers. However, if climate change brings colder, snowier winters to Massachusetts, some decline in this species might be possible.